Successfully Added Void - Quad Band Touchscreen Cellphone Watch with Bluetooth (1.8 inch Screen, 2GB) to your Shopping Cart. Introducing Void, a fully functional unlocked GSM mobilephone with a bright colorful 1.8 inch touchscreen, Bluetooth, and rich selection of multimedia functions. First and foremost, the Void is a high quality quad band GSM (850MHz, 900MHz, 1800MHz, 1900MHz) unlocked mobile phone that fits on your wrist. Stick in a SIM card and use it as a highly convenient mobile phone. This phone features a high quality touchscreen LCD display and virtual keypad for quick dialling and texting while on the go. It also comes with a great Bluetooth headset for further versatility. Better yet, the Void comes with a 1.8 inch touchscreen which is 20% larger than other watch phones on the market, making navigation and viewing photos, videos easier on the eye. Being larger does not have to sacrifice on style though. The Void sports a clean, ultra-sleek design to make it a trendy accessory that will shine on any wrist. The Void is not just an incredible phone, it’s also a powerful multimedia player. No longer will you have to carry around an mp3/mp4 player or iPod. The Void phone watch plays the most popular audio video files, displays photos and is even an ebook reader. Did we mention it comes with a free 2GB TF card too? You can store up thousands of songs, photos, your favourite movie collections and enjoy them anywhere with the Void. Great for cyclists, commuters, and anyone who wants to stop carrying round bulky phones in their pockets or backpack. This is a wonderful product for the internet storefront and re-sale markets too. Sure to be a great seller, order in bulk now to secure your stock and get the best wholesale prices and save on shipping. 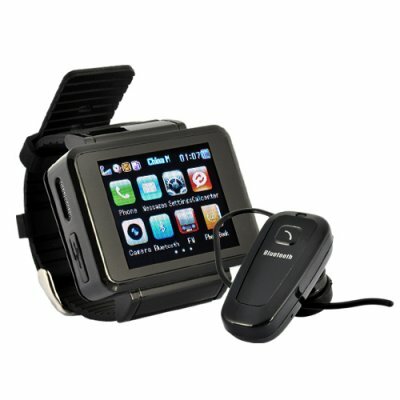 Brought to you by the leaders in wholesale direct from China electronics, Chinavasion. Is the Void water proof? No, the mobile phone wrist watch comes with on board speakers, MIC, and a micro SD card, that are not water proof.